Join La Troupe Makandal on Friday, June 26th for a night of music by new drummers inspired by legends such as Ti Kelep and Azor. Now in its second year, the annual Frisner Augustin Memorial Drum Festival takes its inspiration from Makandal’s memorial tribute to the Master in June 2012, just months after his passing. The festival takes place at Roulette in Downtown Brooklyn, an elegant state-of-the-art concert hall dedicated to the celebration of music. 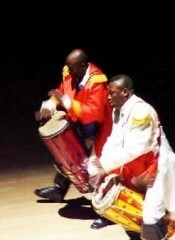 The annual event, which aims to showcase the best of Haiti’s contemporary drummers, realizes one of Maestro Augustin’s long-held dreams. ADMISSION: General – $18 | Student/Seniors – $15 | $20 at the door. This entry was posted on Wednesday, June 3rd, 2015 at 7:00 pm	and is filed under Arts, Events, Music, Theater, Weekend. You can follow any responses to this entry through the RSS 2.0 feed. You can leave a response, or trackback from your own site.